By the spring of 1944 Germany had been dominant in western Europe for four years. After defeat in France in 1940 Britain had been too weak to intervene in Europe. In 1942 and 1943 Anglo-American forces concentrated on offensives in North Africa and the Mediterranean, which ruled out a return to northern Europe. But now, with invasion clearly imminent, Germany’s already stretched armed forces faced the prospect of another major front being opened. The outcome would be decisive. In his Führer Directive No. 51, issued on 3 November 1943, Hitler warned of ‘consequences of staggering proportions’ if the western Allies should gain a foothold. His ambition was simple. He would reinforce the western defences, launch a furious counterattack and ‘throw the Allies back into the sea’. Germany’s air force and navy could do little to resist invasion. The Luftwaffe had withdrawn nearly all its fighters to counter American daylight bombing operations over Germany. The Navy’s warships had been hounded to destruction or were bottled up in ports. Its U-boats would have an almost impossible job penetrating the belt of Allied naval and air defences. The defence of ‘Fortress Europe’ would therefore fall squarely onto the shoulders of the army. 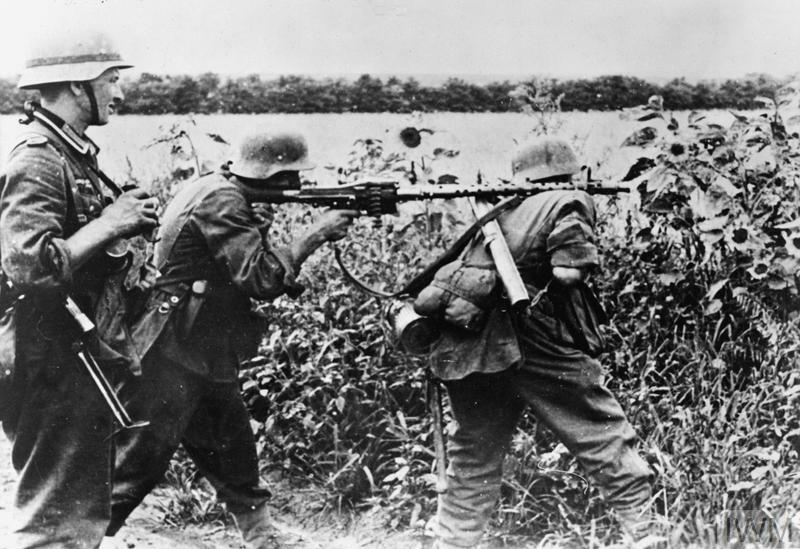 A German MG34 team in action. The MG 34 and the later MG 42 were the best light machine guns of the war. Their fast rate of fire - up to 1,500 rounds per minute for the MG 42 - had a devastating effect on advancing Allied infantry. France and the Low Countries had long been places where divisions burnt out on the Russian Front were sent to recuperate. The coastline was held by a thin line of garrison troops, from where the fittest and most able had been combed to feed the meat-grinder in the East. However, in accordance with Hitler’s directive, units started to be transferred from other fronts, so that by the end of May 1944 a total of 58 German divisions (out of nearly 300) were positioned in France, Belgium and the Netherlands. All German armed forces in the West came under Field Marshal Gerd von Rundstedt, as Commander-in-Chief West (Oberbefehlshaber West or OB West). He had two Army Groups under his command – Army Group B in northern France and the Netherlands, and Army Group G in the South of France. Army Group B contained Seventh Army, defending Normandy and Brittany, and Fifteenth Army north of the River Seine. It was commanded by Hitler’s favourite, Field Marshal Erwin Rommel, who enjoyed a level of access to the Führer unavailable to other commanders, including von Rundstedt. An SS NCO being searched by a US soldier during Operation 'Cobra'. Waffen-SS formations were regarded as the best German forces in Normandy. Most were deployed in the British sector, but the Americans faced 2nd SS Panzer Division and 17th SS Panzergrenadiers. The quality of German infantry divisions varied greatly. The army field divisions and the Luftwaffe parachute divisions were largely experienced and well equipped, even though their size had been reduced to cope with manpower shortages. Most had good artillery provision, and were leavened by officers and NCOs with valuable combat experience in the East. The more numerous ‘static’ coast divisions were much less effective. These had little in the way of transport, and were merely expected to man fixed defences and hold their ground. They contained older troops, the medically unfit, and men recovering from wounds. Some also had contingents of Osttruppen, conscripts or volunteers from the Soviet Union and other eastern territories occupied by Germany. Many were former Soviet POWs and were generally regarded as having little value. These Ost battalions made up one-sixth of Seventh Army’s total number of men. Defeat of the Allies would hinge on the nine panzer divisions and one panzergrenadier division in theatre, with a total of over 1,400 tanks and self-propelled guns. They were held in an armoured reserve called Panzer Group West, commanded by General Leo Geyr von Schweppenburg. For administrative purposes they came under OB West, but von Rundstedt had no direct control over them. These divisions represented the real striking force in the German order of battle, but authority over their deployment and use had become a major bone of contention. Von Schweppenburg was keen to keep the armour well back, hidden north of Paris, until the Allies were committed, and then launch a mass counterattack. In contrast, Rommel feared that Allied air superiority would expose the panzers to devastating fighter-bomber attacks, preventing their movement. He wanted every tank as near to the coast as possible, where in his view the battle would be won or lost. He hoped too that the morale of the infantry manning the beach defences would be strengthened by the presence of elite formations beside them. 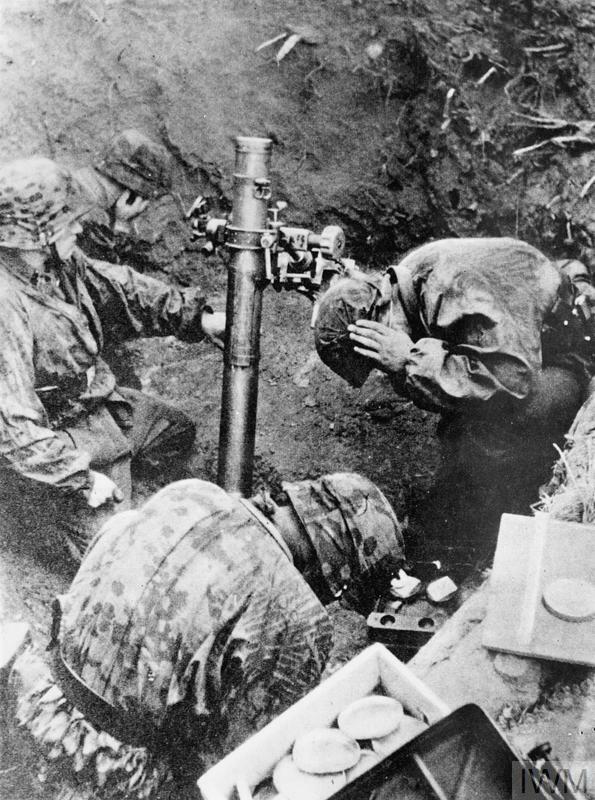 SS troops firing a 100mm Nebelwerfer 35. These smoke mortars could also fire high-explosive shells. 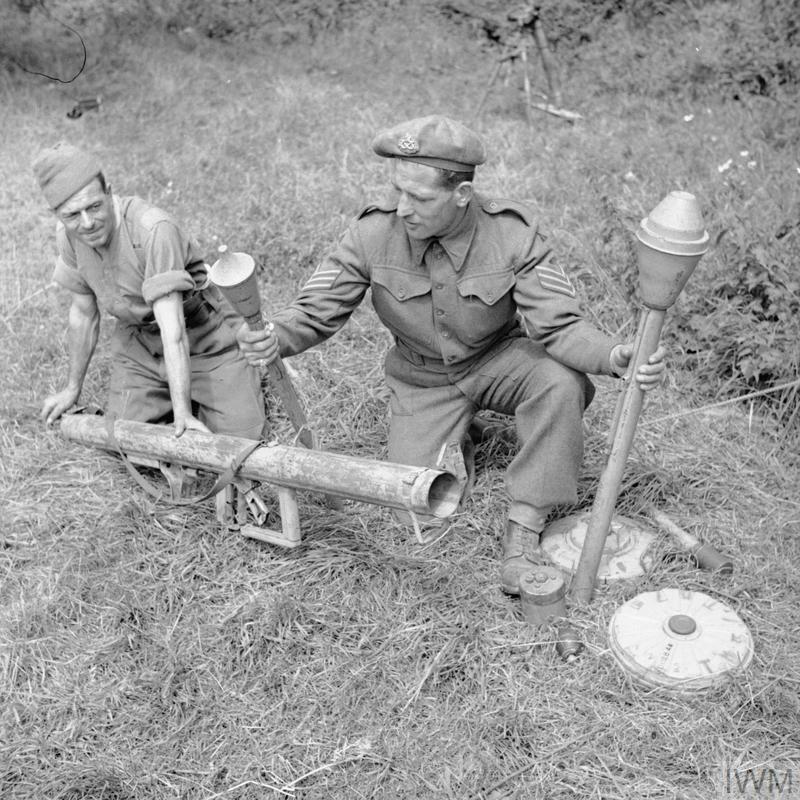 The Germans became expert at concentrating mortar fire for maximum effect. The British called them 'stonks'. It fell to Hitler to decide on the matter, and typically he chose an unworkable solution. Rommel was given operational control of just three panzer divisions, only one of which – 21st Panzer – was located within striking distance of the Normandy coast. The other two – 2nd and 116th Panzer – were held north of the Seine. Three more divisions – 2nd SS, 9th and 11th – were assigned to Army Group G in the South of France. The remaining four divisions – 1st SS, 12th SS, 17th SS Panzergrenadier and Panzer Lehr – stayed with Panzer Group West. But these would now come under the direct operational control of Wehrmacht Supreme Headquarters (OKW). They could not be moved without Hitler’s express permission. Rommel’s determination to defeat the Allies on the beaches meant major improvements needed to be carried out on his first line of defence – the much vaunted ‘Atlantic Wall’. This was the chain of coastal fortifications which stretched from western France to Norway. Begun in 1942, it was still far from complete. The major ports were well guarded, but only in the Pas de Calais was there something like a continuous belt of defences. On his appointment as head of Army Group B in November 1943, Rommel ordered a massive strengthening of the existing fortifications, adding pillboxes, gun emplacements, beach obstacles and millions of mines. In some places the defences were extended inland to cover possible access routes and glider landing areas. Five infantry divisions manned the coastal defences in the areas due to be assaulted by the Allies. The 243rd and 709th Static Divisions were in the Cotentin peninsula, with 709th facing the area of Utah. The 91st Airlanding Division, with the experienced 6th Parachute Regiment attached, was moved there in May to reinforce the defences. The 352nd Infantry Division was a well-trained veteran field formation, recently arrived and undetected by Allied intelligence. It would oppose the American landings on Omaha with devastating consequences. The sector of coast to be attacked by the British and Canadians – designated Gold, Juno and Sword – was held by the 716th Static Division. This formation had been reinforced in late 1943 with experienced officers and NCOs, and would also give a good account of itself. 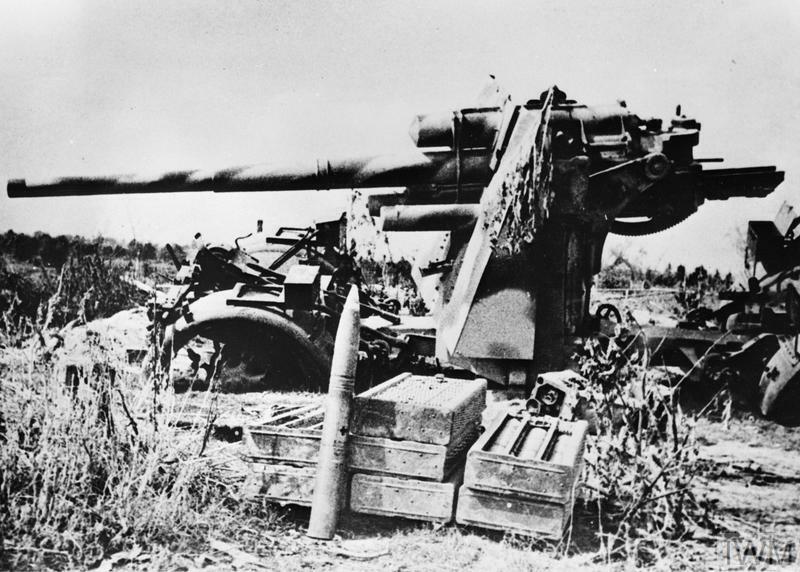 The 88mm Flak 36 was an anti-aircraft weapon that also functioned as a superbly effective anti-tank weapon. British and American armour had no protection against it. During Operation 'Goodwood' carefully hidden '88s' knocked out scores of British Shermans. In the event, German reaction to the landings on 6 June was slow and confused. The spell of bad weather which had made the decision to go so fraught for Eisenhower also meant the Germans were caught off guard. Rommel was visiting his wife in Germany and many senior commanders were not at their posts. 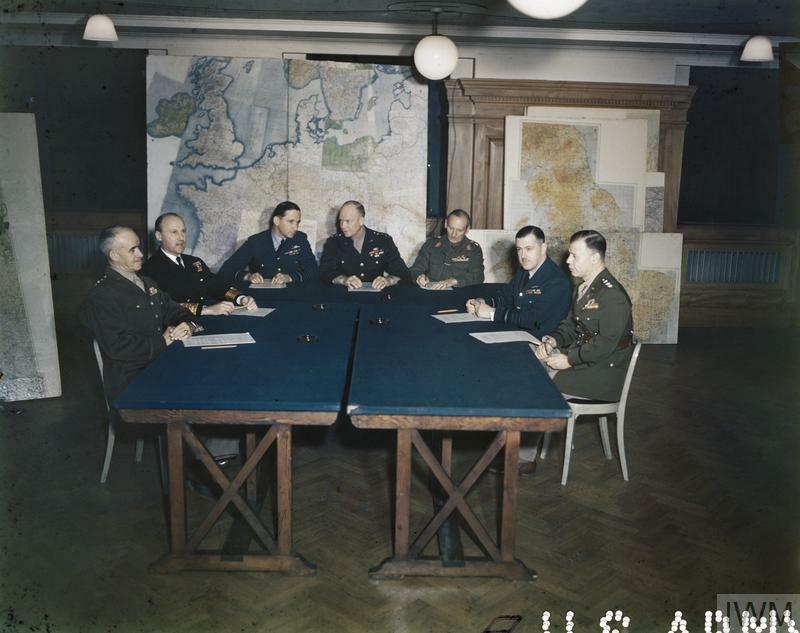 In addition, the Allied deception plan, Operation ‘Fortitude’, convinced OKW – and Hitler - that Normandy was a feint and the main Allied landings would come later in the Pas de Calais region. Fifteenth Army was held there. Such was the success of ‘Fortitude’ that many units were kept away from the Normandy battlefield until July. On D-Day itself, the troops manning the coastal defences did as much as they could have been expected to. The veteran 352nd Infantry Division inflicted heavy casualties on American forces storming Omaha beach. Elsewhere, many bunkers and gun emplacements survived the initial Allied air and sea bombardment, and their occupants held out for several hours. The defenders were gradually silenced and Allied units were able to start advancing inland, but German resistance was enough to prevent them achieving many of their first day objectives. Most crucially, a spirited defence by 21st Panzer Division stopped the British seizing the city of Caen. 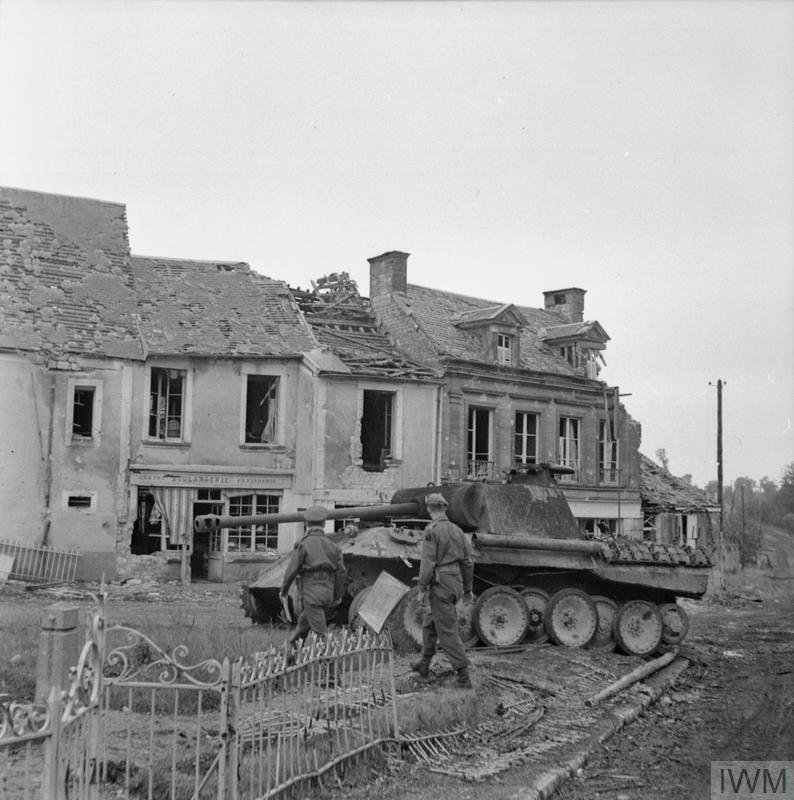 A Panther of Panzer Lehr Division, one of five knocked out in the village of Lingevres by a single Sherman Firefly of 4th/7th Dragoon Guards on 14 June 1944. The Panther was a formidable opponent superior to most Allied tanks, but vulnerable to the British 17-pounder gun mounted on the Firefly. The dispositions of German armour meant only 21st Panzer Division was immediately available for a counterattack. Some of its units had already been engaged by British airborne forces, but it was not until mid-afternoon on D-Day that the division finally advanced against the British north of Caen. The commander of LXXXIV Corps, General Erich Marcks, told Colonel Hermann von Oppeln-Bronikowski, who was leading the attack, ‘if you don’t succeed in throwing the British into the sea we shall have lost the war.’ The German assault was beaten back by British tanks and artillery. Some panzers actually reached the coast, but then had to withdraw. They lost 70 out of 124 tanks. Meanwhile, von Rundstedt secured Hitler’s permission to release formations from the armoured reserve. First to move were the 12th SS Hitlerjugend and Panzer Lehr, but their lead elements would not arrive until the following day. 2nd SS Das Reich also started moving up from the south of France, but its journey would be massively delayed by sabotage and air strikes. Other formations also soon on the way - 17th SS would be in place at Carentan on 11 June. 2nd Panzer Division would enter the battle on 12 June. 1st SS Leibstandarte Adolf Hitler arrived a few days later. Two static divisions from Fifteenth Army were immediately transferred to the Normandy front, and other regular field divisions started moving there from further afield in France. As they were dependent on horses and their own feet, the infantry divisions took much longer than the armoured formations to reach the front. The British failure to take Caen on D-Day and make progress further inland meant the Germans were able to get sufficient forces into the battle area to contain the Allied armies. 12th SS HitlerjugendDivision proved a particularly formidable opponent. By nightfall on D-Day its lead elements were in position on the left flank of 21st Panzer Division, facing the Canadian 3rd Division. Over the next few days the fanatical SS formation made repeated attempts to drive a wedge through to the sea. The Canadians held the SS at great cost but were prevented from continuing their own advance further south, and could only consolidate their positions. By 9 June the German Army’s elite Panzer Lehr Division had also arrived. It took up position west of Hitlerjugend, opposing British 50th Division around Tilly-sur-Seulles, south of Bayeux. These three formations formed the main defence for Caen, but plans for a major counterattack had to be abandoned as a result of Allied air attacks. British troops pose with captured German infantry anti-tank weapons. The Panzerschreck was based on the American bazooka. The sergeant is holding two versions of the most effective Panzerfaust single-shot weapon. By his feet are two Teller mines. Hitler insisted that German strategy be one of using the panzerforces to roll up the Allies from the east. Units elsewhere would hold their positions. Retreat was out of the question. The Germans maintained intense pressure against the British airborne forces’ bridgehead east of the Orne, to prevent a British breakout from that quarter. Panzer Group West’s armoured formations would concentrate against British Second Army around Caen. Seventh Army’s infantry divisions would hold Cherbourg and defend against US First Army west of the River Vire. For the rest of June, General Bernard Montgomery, commanding all Allied ground forces, made several attempts to envelope Caen. All failed in the face of tenacious German resistance. 21st PanzerDivision and the newly arrived 346th and 711th Infantry Divisions blocked 51st Highland Division east of the city, albeit at great cost. To the west of Caen, 50th Division was frustrated trying to push south from Bayeux towards Tilly-sur-Seulles. The British then tried an armoured right hook by 7th Armoured Division around the left flank of Panzer Lehr towards Villers-Bocage on 12th June. This was initially stopped by Tiger tanks of 101st Heavy SS Tank Battalion, most notably the vehicle commanded by the celebrated tank ace SS-Obersturmführer Michael Wittmann. On 13 June Wittmann single-handedly destroyed 11 British tanks and 13 other armoured vehicles. In the wider battle, Panzer Lehr and 2nd Panzer Division, which was also now in theatre, forced a general British retreat. The failed battle at Villers-Bocage was the last chance the British had for quickly outflanking Caen. The Germans had successfully plugged the gaps in their line before the Allied build-up became overwhelming. The defensible terrain gave them a significant advantage, and they enjoyed a measure of weapon superiority. But the Germans had no answer to the prodigious firepower of the Allies. Air strikes, artillery and naval bombardment inexorably depleted already under-strength formations. A wrecked German SdKfz 250 half-track in the village of Christot. Allied fighter bombers took a heavy toll of German tanks, vehicles and horse draw transport during the retreat of the Seventh and Fifth Panzer Armies from Normandy. Unlike the British or Americans though, German units could continue to function even when substantially reduced by casualties. Many had combat experience in the East. They were used to operating in improvised battlegroups, thrown together when occasion demanded. They excelled at local counterattacks, quickly recapturing villages and ground taken by the enemy. This meant that time and again, small groups of troops could effectively block much larger Allied formations. But all the while, as they successfully resisted repeated attacks, the Germans were losing precious men and tanks that could not be replaced. As the German line stiffened, Montgomery was forced to use ever larger forces to try and break through. Operation ‘Epsom’, launched on 26 June, was an attempt to outflank Caen from the west. The offensive failed, but it took most of the six panzer divisions now around the city to hold the British advance, and their losses were heavy. By this time the II SS Panzerkorps, consisting of 9th and 10th SS Panzer Divisions, had arrived from the East. The original intention had been to use these fresh formations to lead a decisive new counterattack. Instead, they had to be fed into the line to shore up the defences. After ‘Epsom’ the German commanders faced bleak reality. Von Schweppenburg was arguing for a withdrawal into the French interior to conduct a mobile defence. Rommel and von Rundstedt both tried to persuade OKW that the situation was impossible. Instead Von Schweppenburg was sacked on 1 July and von Rundstedt told to retire. It was not long before his replacement, Field Marshal Günther von Kluge, was also advocating withdrawal. The Seventh Army commander, General Friedrich Dollman, shot himself. 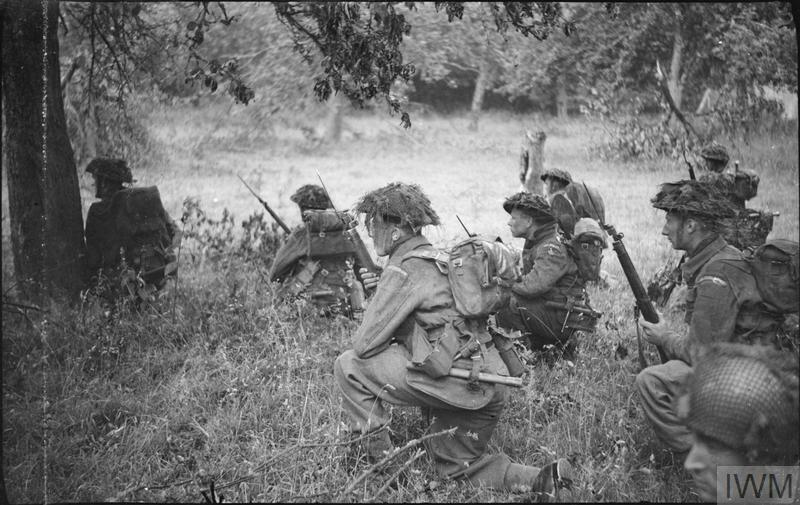 Montgomery launched another set piece attack to capture Caen – Operation ‘Charnwood’ – on 8 July. The 12th SS HitlerjugendDivision remained the backbone of the defence, but was decimated by the assault which included carpet bombing and a huge artillery bombardment. It was reduced to several hundred infantry and 40 tanks. The 16th Luftwaffe Field Division was virtually wiped out. Though they were still containing the British and Americans, the German Army in Normandy was being bled white in a relentless battle of attrition. After ‘Epsom’ and ‘Charnwood’ it was obvious to most that the battle was lost. Attempts to concentrate armoured units for a decisive counterattack were repeatedly stymied by Allied attacks and the need to support infantry formations. Allied firepower was overwhelming. Supplies of fuel and ammunition were held up by air attacks. There was only a trickle of reinforcements. Rommel himself was now out of the battle, seriously injured by an aircraft attack on 17 July. He would eventually be implicated in the plot to kill Hitler and forced to take poison. Günther von Kluge took over his duties as commander of Army Group B. 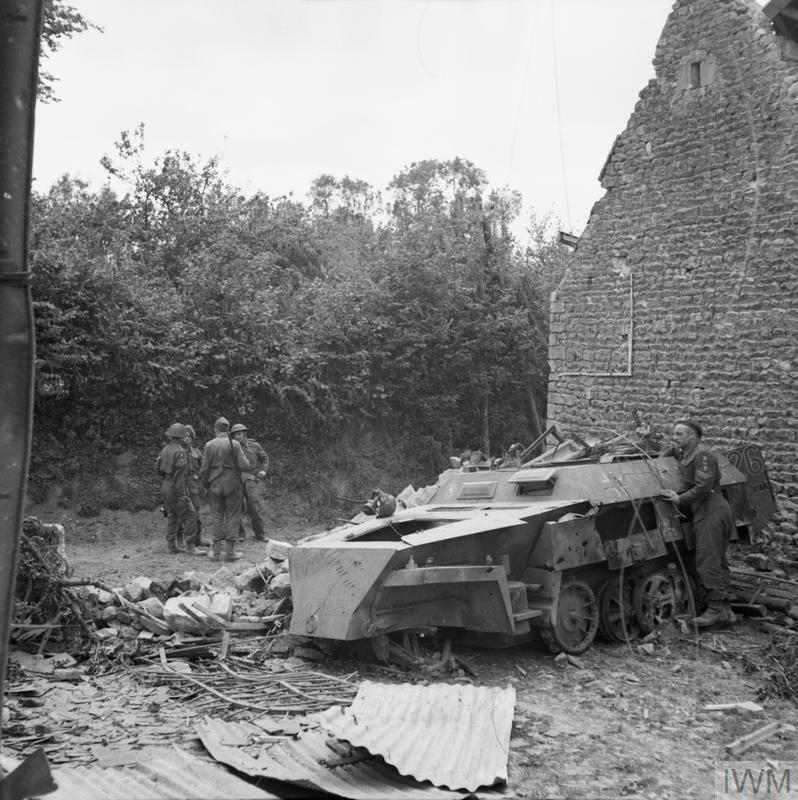 On 18 July the British launched a major armoured attack from the Orne bridgehead east of Caen – Operation ‘Goodwood’. Three armoured divisions advanced along a corridor blasted by heavy bombers, aiming to capture the Bourgébus ridge and continue towards Falaise. But the Germans had established a defence zone several miles deep, based around a number of fortified villages. The British attack faltered as German tanks and 88mm anti-tank guns exploited the open terrain. The long-range superiority of German guns and the weakness of British tank armour were decisive factors. ‘Goodwood’ saw the Germans stage their most effective defence of the campaign, but it was to little avail. Panzer Group West (now renamed Fifth Panzer Army) was still concentrated in the British sector, where the Allied commanders wanted it to be. The last available uncommitted armoured formation - 116th Panzer Division – was ordered to move from Fifteenth Army to the Caen front on the same day. The Germans remained weakest in the west of the Allied lodgement area, where the decisive breakout was now set to occur. After clearing the Cotentin peninsula and capturing Cherbourg, which finally fell on 27 June, the US First Army had begun a push towards the vital road junction of St-Lô. The Germans had again exploited the difficult bocage terrain to exact a heavy toll of the advancing Americans. St-Lô fell on 19 July but bad weather postponed further US operations until 25 July when Operation ‘Cobra’ was finally launched. It was the main US offensive. The Germans could field only seven weakened infantry and parachute divisions, supported by 2nd SS Das Reich, Panzer Lehr (re-located from the Caen sector) and the remnants of 17th SS Panzergrenadier Division. The Allied bombing attack that preceded Operation ‘Cobra’ effectively wiped out Panzer Lehr. The destruction was foreseen by some commanders but was unavoidable as there was not enough infantry to enable armoured units to be pulled back. Unlike in the Caen sector, the German defences in front of US First Army were neither deep nor continuous and could be outflanked. Once through the front line, the Americans were able to make good progress. The German High Command again demanded that each soldier fight and die where he stood. By 28 July the Americans had taken Coutances and the floodgates were opened. On 30 July the crucial road junction of Avranches at the base of the Cotentin peninsula was captured. General George Patton’s US Third Army was activated and began a headlong advance west into Brittany, south to the Loire and east towards the Seine. During this mobile phase of the campaign, German forces could no longer put up an organised resistance. The front was now shattered, with isolated German units fighting as best they could. As ever, troops caught in the open as they tried to escape or re-deploy were pounced on by Allied fighter-bombers. 2nd and 116th PanzerDivisions were belatedly moved from the British sector to try and stop the Americans, but could only hold a north-south defensive line on the River Vire. To exploit the breakout, the British launched Operation ‘Bluecoat’ on 30 July from Caumont in the central part of the Normandy front. The objective was Mont Pinçon and the town of Vire. This forced von Kluge to pull more armoured units away from Caen. The British advance in the difficult terrain of the Suisse-Normande was slow. In contrast, Patton’s headlong advance eastwards reached Le Mans on 8 August, and was threatening Alençon. The entire German position in Normandy was being outflanked, and von Kluge pleaded for an immediate withdrawal. Instead, Hitler made matters even worse by ordering a counter-attack from Mortain towards Avranches to cut off the American breakthrough at its narrowest point. Operation ‘Lüttich’ began in the early hours of 7 August and involved five panzer divisions. Together they could only muster about 220 tanks and 70 assault guns. Over three days the German force advanced no further than 5 miles while American artillery, anti-tank gun screens and fighter-bombers inflicted heavy losses. At least 100 tanks were destroyed. Hitler’s stubbornness stopped von Kluge from withdrawing his forces to the Seine, now the only rational course open, and played right into Allied hands. The Allies had originally planned a ‘long envelopment’ of the Germans, trapping them against the Seine, but the Mortain counterattack provided the opportunity for a more compact encirclement. The Americans would push north to Alençon and Argentan while the Canadian First Army struck south towards Falaise. The British Second Army would push east to complete the encirclement. The Canadian advance south of Caen – Operation ‘Totalise’ – began on 7 August and made slow progress against the usual expert German defence. 12th SS Hitlerjugend still had 48 tanks available, with 19 Tigers of 101st Heavy SS Tank Battalion under command. The screens of 88mm guns were deadly as ever, knocking out scores of Shermans. The Canadian British Columbia Regiment lost 47 tanks – its entire strength – on 9 August. Hitler finally agreed to a general withdrawal on 16 August, and a full large scale retreat began. It was of course much too late, but many troops managed to extricate themselves from what became known as the Falaise Pocket, even if they had to abandon nearly all their vehicles and equipment. The Allies eventually linked up at Chambois on 19 August, but even then a desperate local defence kept the pocket open for two more days. Resistance finally ceased on 22 August. 20,000 German troops escaped, but Seventh Army and Fifth Panzer Army had effectively ceased to exist. Twenty-five out of 38 German divisions had been utterly destroyed. The rest had been reduced to shattered remnants. In total, the Germans suffered 290,000 casualties in Normandy, including 23,000 dead, 67,000 wounded and around 200,000 missing or captured. Some 2,000 tanks had been committed to the battle, but the panzer divisions were left with about 70 tanks between them. Given the firepower, air superiority and resources available to the Allied nations, it is doubtful if any strategy or deployment on the part of the German armed forces could have changed the outcome. But German troops fought well on D-Day and then kept Allied forces bottled up in their lodgement area for seven weeks. They suffered from shortages of everything, received minimal reinforcements and were utterly exposed to the depredations of Allied air power. Despite all of this, and the dead hand of Hitler reaching from his headquarters on the other side of Europe, they conducted a masterly defence, inflicting heavy losses on their opponents. Much of this was down to the fact that they had chosen the ground, and could benefit from all the defensive advantages that such congested and enclosed terrain offered. Some of it was the result of hesitant or clumsy Allied tactics. The Germans also possessed tanks and weapons that in many ways were superior to those of the Allies. But there is also no doubt that the fighting quality of the German soldier himself, whether motivated by fanaticism, discipline or fear, was a significant factor. The campaign in Normandy was the greatest military defeat yet suffered by the German armed forces, but it was also an exposition of German fighting power. The 'Market Garden' plan employed all three divisions of First Allied Airborne Army. 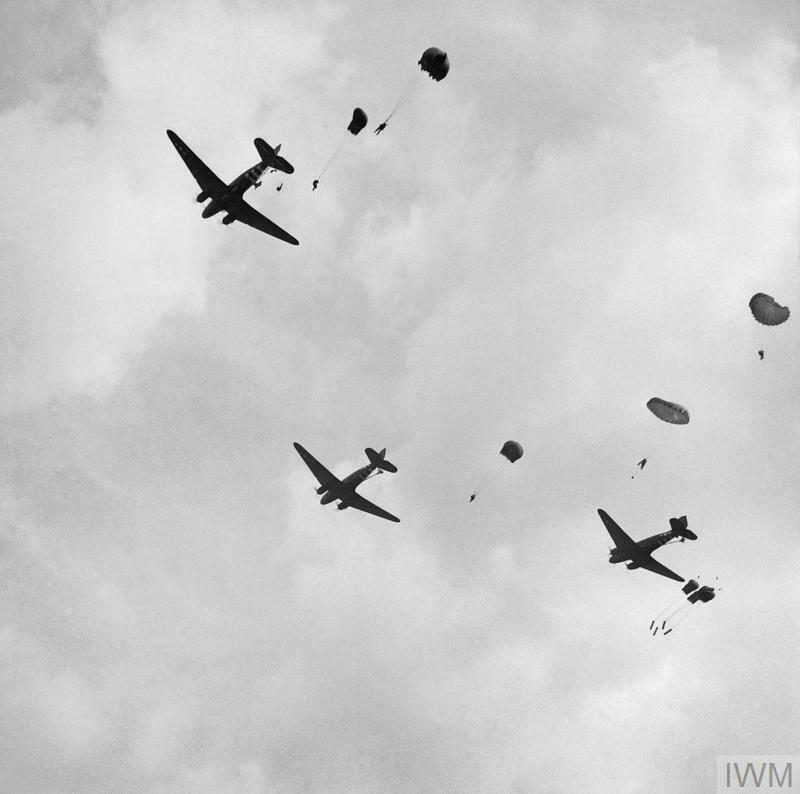 Altogether, some 35,000 parachute and glider troops were involved in the operation. The Normandy campaign saw the Anglo-American armies inflict a decisive defeat on the German military machine. The British Army's role was pivotal, but victory came at a price. Between D-Day and the end of August some 83,000 British, Canadian and Polish troops became casualties, of whom almost 16,000 were killed.